There’s the often quoted title to the Thomas Wolfe novel, “You Can’t Go Home Again.” Without ever reading any further, you can come up with your own ideas on not being able to go home again. For Wolfe, that meant that home would never be the same. In the new comic, “We Can Never Go Home,” published by Black Mask Studios, there’s that extra tinge in the title that elicits images of bridges that have been burned to a crisp. Well, thank God for evocative titles. And this comic lives up to it. With plenty of blood and fireworks, we follow Madison and Duncan on the first leg of their road to self-discovery in this first issue. The toughest nut to crack with an unknown comics title is, well, the fact it is an unknown. That brings to mind Donald Rumsfeld. He said something about there being known unknowns and unknown knowns. If the man read comics, instead of waging war, just imagine what a better place this would be. 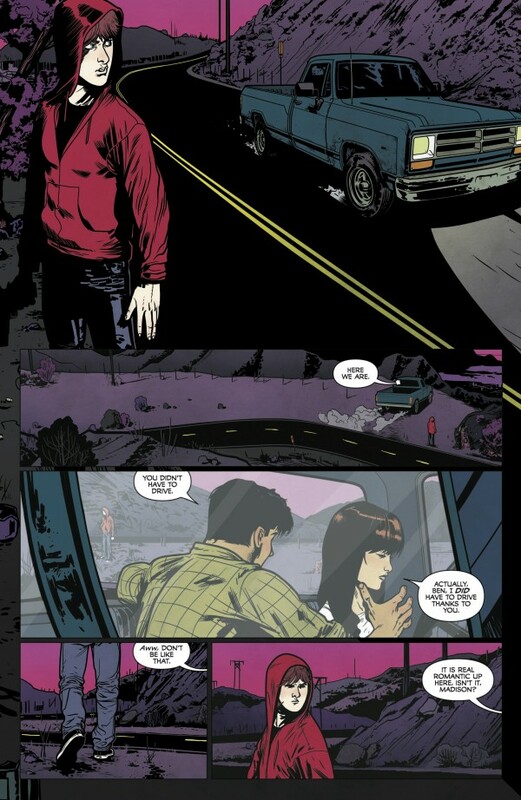 Anyway, my point is that a totally unknown comics title is the last one asked to the prom. It’s tough. You don’t want to hype the hell out of it either as that can backfire. Nothing can be left to chance. So, that title alone, “We Can Never Go Home,” steps up to the plate. Why is going home not an option? What could have happened that’s so terrible that going home would be the last thing you’d do? These two teens have a whole lot of trouble to deal with. You can tell, right away, in their sad and confused eyes. It would have been a struggle but Madison might have managed to get by. But not Duncan. Both have what you’d call super abilities (think X-Men) that they have yet to master. And both were never meant to socialize with each other except for a chain of events that locked their destiny. Duncan, a so-called nerd, happened to spy on Madison and her brute of a boyfriend, Ben. Since that frantic meeting between the three of them, Madison split up with Ben. And Ben split Duncan’s nose. Ah, teen romance. Writers Matthew Rosenberg and Patrick Kindlon provide a credible mashup of teenage romance and superhero adventure plus a good mix of crime fiction. The artwork by Josh Hood provides a nice clean and precise line. He does a great job playing off static poses evoking teen angst and cool. Both Madison and Duncan are deeply hurt and so wrong for each other. But fate keeps pushing them closer together. Madison can call Duncan an idiot all she wants but, when it comes down to it, she needs him. Duncan is such a mess that he seems beyond redemption and yet he keeps fighting. You’ve got a whole new Bonnie and Clyde thing going on here and it’s got my attention. Not bad for such an unknown title. But, really, this is not an altogether unknown unknowable unknown. Go visit Trip City and you’ll find Matthew Rosenberg and Patrick Kindlon’s webcomic, MENU, the story of a boy and a dog wandering the wastelands of a future America as they try to keep each other alive in a world running out of food. And check out Josh Hood and his artwork including JLA: Scary Monsters and Venom. 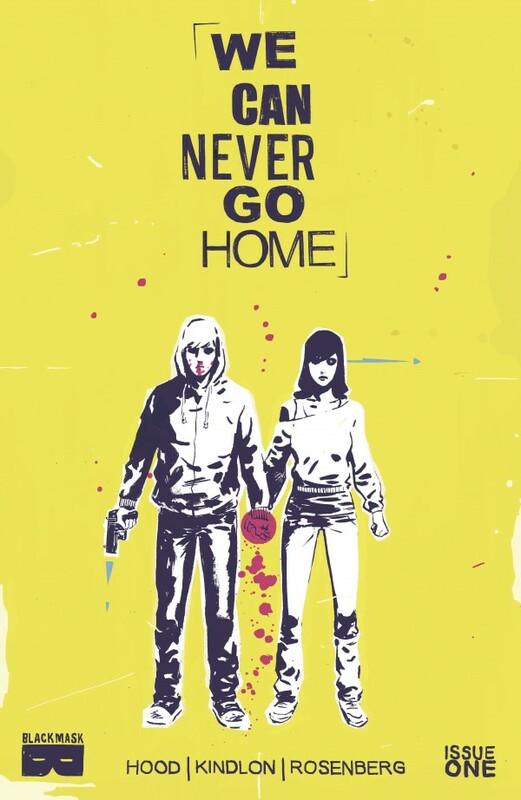 YOU CAN’T GO HOME #1 is published by Black Mask and available as of March 25. For more details, visit our friends at Black Mask Studios right here.